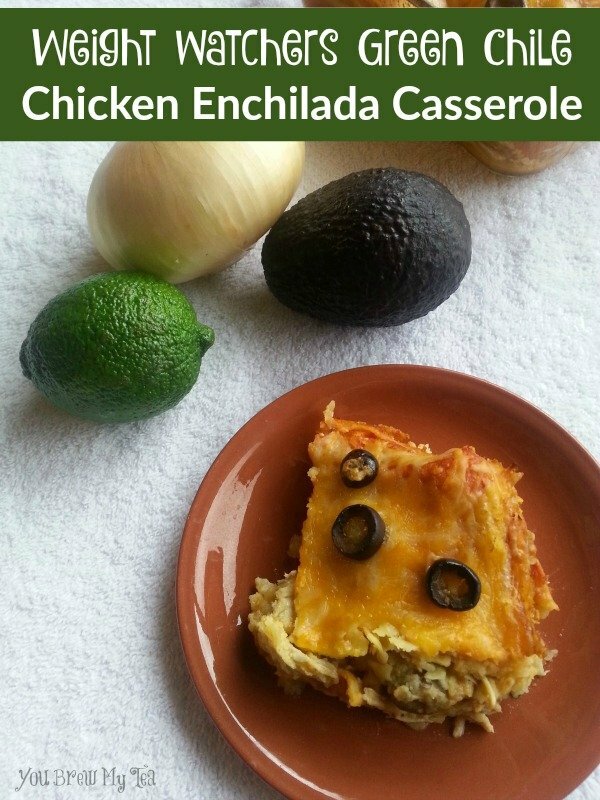 We kind of love anything with a Mexican flavor profile, and this Weight Watchers Green Chile Chicken Enchilada Casserole is a favorite in our house. Not only have we managed to lower he calories while keeping the flavor, this recipe has given the Wee Child a new found love for caramelized onions. Weighing in at only 5 Weight Watchers Points Plus per serving, it is a hearty meal that definitely satisfies our cravings. This is really a fairly simple casserole to assemble, especially if you do prep work ahead of time. We start by tossing boneless skinless chicken breasts into a Mini Crockpot and then cover it with Frontera Green Chili Enchilada Sauce. We have made it from scratch, used other brands and always end up coming back to this one. Quality at a reasonable price and it saves us a ton of time in the kitchen. I cook this for 3-4 hours or until the chicken is cooked through and I can easily shred it. I turn off the heat, shred the chicken and set aside. Depending on how close to assembly time it cooks, I’ll tuck it away in the fridge for later. When we are ready to assemble and bake, I slice up one onion thinly. I cook them in a bit of olive oil until caramelized. This time, the Wee Child helped by tending the onions for me. At 7 years old, he is really learning his way around the kitchen. I am super proud of him. I toss those onions in with the chicken and sauce and set aside. I immediately pour my tomato sauce, chicken broth, cumin and garlic powder into the same pan and bring to a simmer. I reduce heat and add in the heavy whipping cream. It adds a creaminess without a ton of extra calories that is really needed to bring this together. Once that has simmered for a few more minutes, we begin assembly. I layer with tortillas on the bottom, next the chicken mixture, then a pinch of cheese, then a few olives and 1/3 of the sauce we made. We made 3 layers in this dish, and that would likely be how may you would make in a traditional 8×8 pan. I happen to love this Pyrex dish because it has a lid that fits it so well for tucking into the fridge. 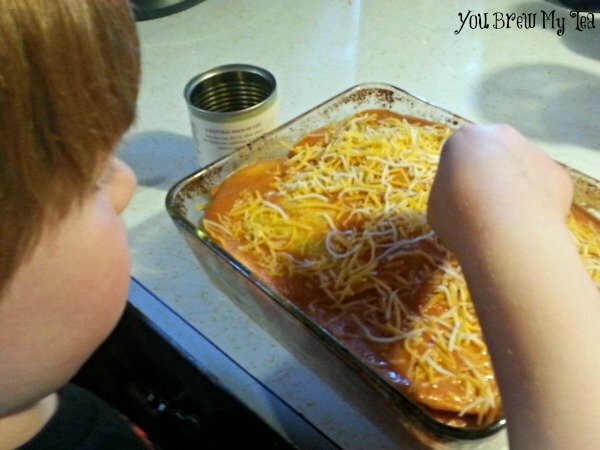 As you can see, the Wee Child enjoys putting the final touches of cheese and olives on top before we tuck this into the oven. We cook at 350 degrees for 30 minutes or until bubbling and golden brown on top. 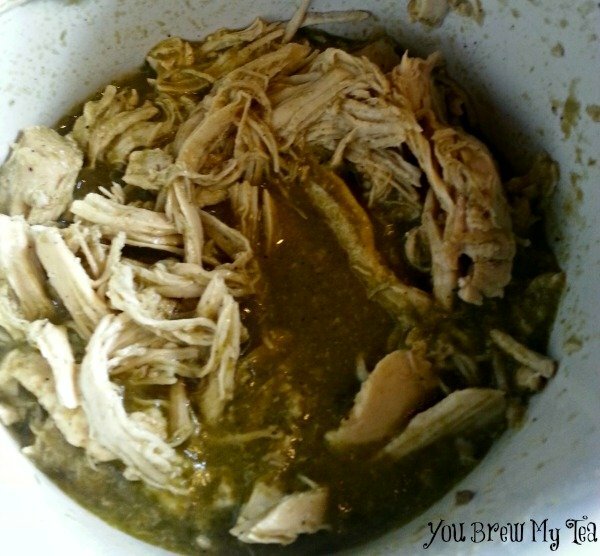 Place chicken and green chili enchilada sauce in small Crockpot and cook for 3-4 hours on high. Turn off Crockpot and shred chicken, leaving in sauce. Set aside, cool and/or refrigerate until ready to assemble. In nonstick skillet heat Olive Oil and onions. 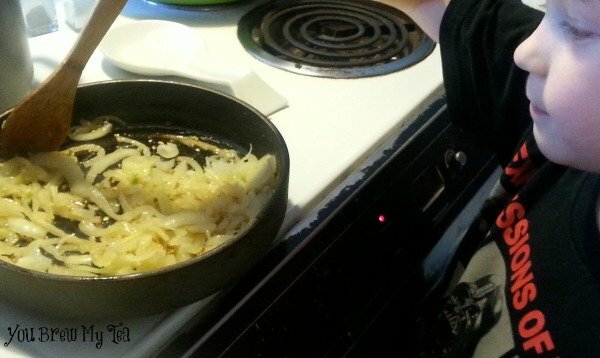 Cook onions over medium heat until caramelized (10-12 minutes). Stir occasionally to prevent sticking. Add onions to chicken mixture, but do not wash pan. In same pan, add tomato sauce, chicken broth, cumin, garlic and salt and bring to a boil. Reduce to a simmer and add heavy whipping cream to mixture. 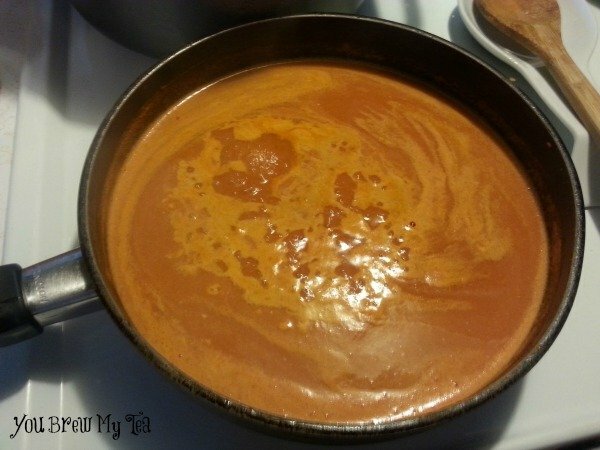 Cook for an additional 4-5 minutes or until thickened slightly. 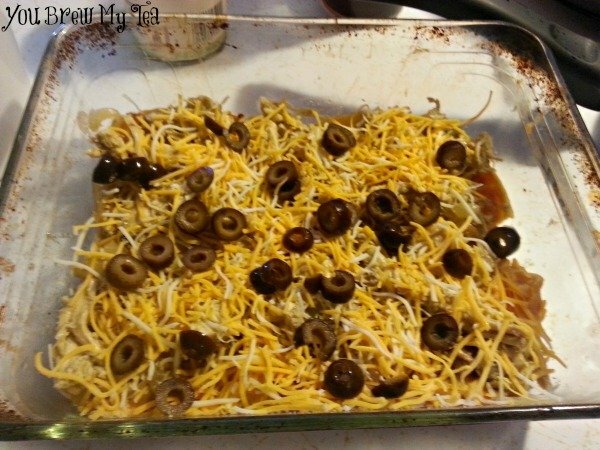 Assemble casserole starting with tortillas, chicken, cheese, olives then sauce. Use ⅓ of each item finishing with sauce and extra cheese & olives on top. 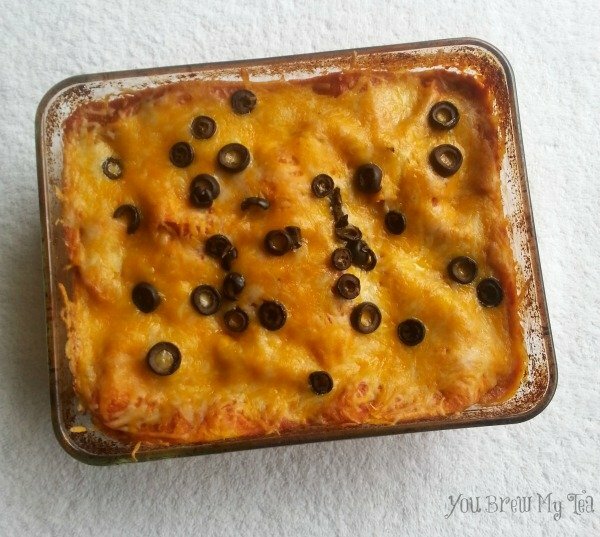 I calculated this using the Recipe Builder within Weight Watchers. I have loved being a Weight Watchers member, and can really see a huge difference in the accuracy of point values when using the online tool they provide. You can also invest in the Weight Watchers SmartPoints Calculator and get the same results. I’m not affiliated with them, I just love them! This is one of our favorite meals, because it is so hearty and tasty. Rich flavors, perfect texture and so much like our favorite Mexican dishes this green chile chicken enchilada casserole is one everyone will enjoy. At only 5 SmartPoints per serving, you will be making double batches of this to freeze for easy lunches throughout the week. Check out some of our other favorite Weight Watchers recipes listed below! I’m curious how cut for 10 servings in a 8×8 pan. Is an 8×8 pan what is used or 9×13? It was made in an 8×8 pan. It has been some time since it was made, so I cannot tell you how we did 10 servings, only that all of my notes state that it was a 10 serving meal. Sometimes I will weigh out servings on recipes or measure by the cup. That may have been the case on this recipe.